Each month Assistant Research Scholar Patrick J. Burns interviews a member of our research community on an ancient language that they are teaching or have taught at ISAW and collects references to recommended textbooks, grammars, lexica, and other language-learning resources at the ISAW Library, NYU Libraries, and online. Sumerian is the oldest language that we can read that has come to us from antiquity, with clay tablets surviving from as far back as roughly 3200 BCE. As a spoken language, it likely died out around the middle of the second millennium, but continued to be used as a literary language for at least another 900 years. There is evidence that it continued be copied and studied during the life of Alexander and perhaps even into second century CE. That said, Akkadian—that is, Babylonian and Assyrian—had already become the dominant vernacular language of the region by 1800 BCE and perhaps much earlier. Sumerian is written in cuneiform, a script composed of wedge-shaped signs formed by impressing moist clay tablets with the sharpened end of a reed stylus. The earliest surviving tablets are predominantly administrative records and teaching materials from the end of the fourth millennium, but over time Sumerian literature would encompass a wide range of forms and genres. We have royal inscriptions, such as the Gudea Cylinders, as well as early examples of epic poetry, like the Matter of Aratta. Myths, hymns, laments, wisdom literature, as well as what Thorkild Jacobsen calls the “practical genres,” such as grammatical texts, date lists, and mathematical works have all come down to us in Sumerian. When I heard that Gina Konstantopoulos, Postdoctoral Researcher in the Faculty of Theology at the University of Helsinki and former ISAW Visiting Assistant Professor, was teaching a directed reading on Sumerian this semester, my interest was piqued. How would someone curious about the language get started, and what do we have on hand at the library to help them? I sat down recently with Konstantopoulos, who earned her doctorate in Ancient Near Eastern Studies from the University of Michigan, to discuss learning Sumerian. Here are her recommendations, from grammars to lexica, from texts to translations, and where you can find them while at ISAW. Still, as Foxvog notes in the preface to his Grammar, his book is really meant to be used “under the guidance of a teacher who can describe the classic problems in greater detail, add current alternative explanations for phenomena, help the student parse and understand the many textual illustrations found throughout, and provide supplementary information about the history of the language and the culture of early Mesopotamia.” These are not insignificant hurdles. Luckily, some of these demands can be addressed by other resources. Signlists will prove indispensable as you proceed in Sumerian. Konstantopoulos points to C. Mittermayer’s Altbabylonische Zeichenliste der sumerisch-literarischen Texte [Vandenhoeck & Ruprecht; Ref 4 PJ3223 .M455 2006] as an excellent, if hard-to-find, resource. Mittermayer’s work collects 480 cuneiform signs from literary texts of the Old Babylonian period, supplemented with quotations and commentary. 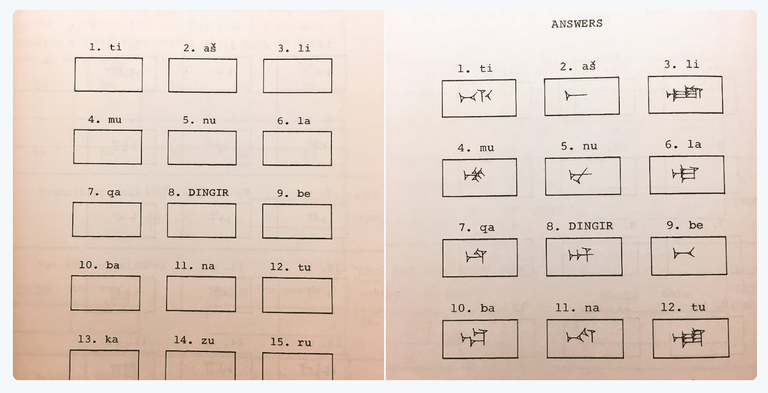 Akkadian signlists (like the one found in D. B. Miller’s An Akkadian Handbook: Helps, Paradigms, Glossary, Logograms, and Sign List [Eisenbrauns; Ref 4 PJ3251 .M75 2014]) can also be helpful in developing proficiency with the Sumerian writing system. When asked to recommend a dictionary for Sumerian students, Konstantopoulos hesitated, saying that there is not yet a complete, comprehensive work in the style of the The Assyrian Dictionary of the Oriental Institute of the University of Chicago (CAD) [Oriental Institute of Chicago; Ref 4 PJ3525 .A87 1956; available online]. Perhaps the most useful resource in English is the Electronic Pennsylvania Sumerian Dictionary (ePSD), an ongoing online lexicon project of Sumerian—an extension of the the print project started in 1976, The Sumerian Dictionary of the University Museum of the University of Pennsylvania [Babylonian Section of the University Museum; Ref 4 PJ4037 .S86 1984]—which covers cuneiform texts from ancient Iraq between 2700 and 1600 BCE. 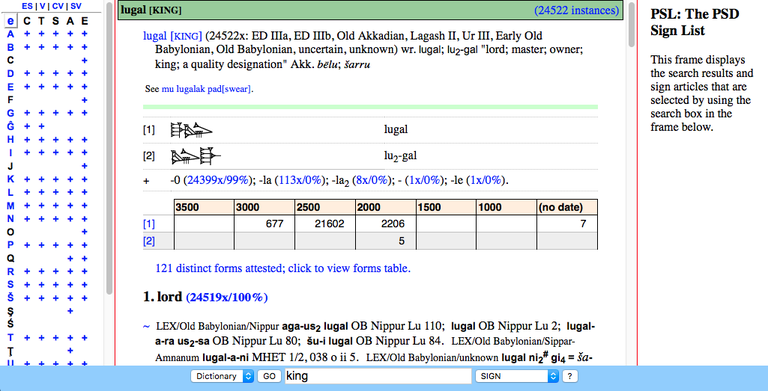 The ePSD allows for English searches for basic definitions with citations from Sumerian texts and a host of usage statistics including overall frequency, frequency by date, and distinct forms among others. In addition, words in the ePSD link to linked from the lexicon entries to all the places where they occur in a corpus of about 90,000 texts. A beginning student comfortable with French may be better served by P. Attinger’s Lexique sumérien-français (available online). Another online glossary worth noting is the Leipzig-Münchner Sumerischer Zettelkasten [available online]. One advantage of the ePSD is that the site is keyed to other online Sumerian texts, such as UCLA’s Cuneiform Digital Library [available online] and Oxford’s Electronic Text Corpus of Sumerian Literature (ETCSL) [available online]. The CDLI is an online portal that curates cuneiform tablets, inscriptions, and other text artifacts for open access research. The project has catalogued, photographed, and digitized more than 320,000 artifacts, nearly half of which include Sumerian text. The ETCSL presents transliterations and English translations of Sumerian literary texts as well as bibliography and source information. (The site also contains a “Consolidated bibliography of Sumerian literature” that students may find useful.) The corpus contains Sumerian texts in transliteration, English prose translations and bibliographical information for each composition. The transliterations and the translations can be searched, browsed and read online using the tools of the website. 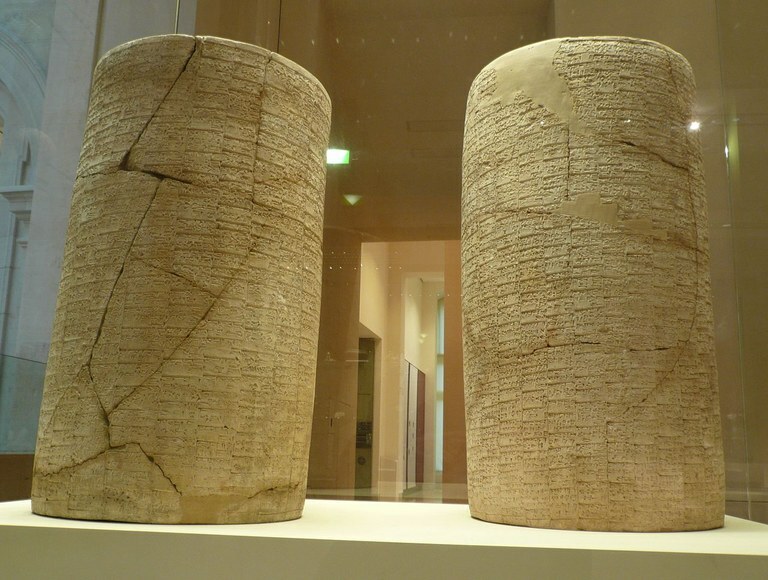 There is also the Electronic Text Corpus of Sumerian Royal Inscriptions [available online], part of the Open Richly Annotated Cuneiform Corpus (ORACC) project, which hosts inscriptions which have been transliterated, translated into English and Hungarian, and morphologically annotated. Students looking for a solid print source for Sumerian primary texts can turn to K. Volk’s A Sumerian Reader [Pontificio Istituto Biblico; Small PJ4014 .V65 1997]. The reader contains 44 texts ranging from royal inscriptions to legal and economic documents, though it does not include any literary texts. The reader—a slim 110 pages—is packed with helpful resources for the elementary student: texts, transliterations, a sign list, phonological charts, and glossaries for vocabulary, divinities, persons, places, dates, buildings, and festivals. Beyond Volk, however, Konstantopoulos explains that much of the source material tends to appear in scholarly articles. As for translations, Konstantopoulos recommends a few volumes that cover the range of Sumerian literature. In The Harp that Once… [Yale; Small PJ4083 .H37 1987], T. Jacobsen presents verse translations of Sumerian poetry with introductions and notes for a general audience. (Jacobsen describes his translation as “high prose and short lines,” but the overall effect is a verse translation.) Another excellent option is The Literature of Ancient Sumer [Oxford; NYU PJ4083 .L57 2004; ebook here] edited by J. Black, G. Cunningham, E. Robson, and G. Zólyomi. This volume is a comprehensive anthology of extant Sumerian—though not as comprehensive as the ETCSL from which it is drawn. It covers the full range of genres and benefits from the (considerable) development in the understanding of Sumerian since the publication of Jacobsen’s volume. The introduction to The Literature of Ancient Sumer alone could be recommended as a general overview of the period and its literary output, not to mention an overview of the language’s decipherment and increased understanding over the last century and a half. More focused, but certainly of interest to students interested in the development of Mesopotamian literature is H. L. J. Vanstiphout’s Epics of Sumerian Kings: The Matter of Aratta [Brill; NYU PJ4083. V36 2004; ebook here], which covers the earliest known examples of epic poetry. Of particular interest to language learners is the second epic presented here, “Enmerkar and the Lord of Aratta,” which recounts both a proto-Tower of Babel tale of language interaction and the mythical invention of writing. Konstantopoulos cautions students that the understanding and interpretation of Sumerian is still evolving, and for that reason, so are translations. This accords well with Jacobsen’s warning in the “Introduction” to his book: “The translations here presented can…be offered only as a subjective attempt, though one that I sincerely hope and trust is true in its essentials.” The student is advised. That said, someone who is learning Sumerian alongside reading these translation is likely well attuned to the language’s interpretative difficulties and especially sympathetic to Jacobsen’s words. Once you have made headway with Sumerian fundamentals, there are some more detailed grammars that will become indispensable. Konstantopoulos recommends the following linguistics-focused resources for such students: P. Michalowski’s chapter “Sumerian” in the Cambridge Encyclopedia of the World’s Ancient Languages [Cambridge; Ref 4 P371 .C36 2004], edited by R. Woodward; M.-L. Thomsen’s The Sumerian Language: An Introduction to its History and Grammatical Structure [Akademisk Forlag; Ref 4 PJ4021 .T46 1984]; and B. Jagersma’s 2010 dissertation, A Descriptive Grammar of Sumerian [PhD Diss., 2010; available online]. Another grammar that students may find useful as their Sumerian skills mature is D. O. Edzard’s Sumerian Grammar [Society of Biblical Literature; Ref 4 PJ4013 .E38 2006]. For morphology specifically, Konstantopoulos brings our attention to G. Rubio’s chapter “Sumerian Morphology,” in the collection Morphologies of Asia and Africa, Vol. 2 [NYU P381.A75 M67 2007; ebook available], edited by A. S. Kaye. The study of a language cannot be divorced from its historical and cultural context. H. E. W. Crawford’s edited volume The Sumerian World [Routledge; NYU DS72 .S864 2013; ebook available] contains over thirty chapters on material remains, systems of government, daily life, and neighboring societies among other topics. A cursory sense of Sumerian’s place relative to other Mesopotamian languages can be found in I. Finkel and J. Taylor’s Cuneiform [British Museum; NYU DS69.5 .F55 2015], which in addition to its efficient overview to the script is also beautifully illustrated by photographs of the British Museum’s collection. Additional context on the materiality of Sumerian and its art historical context can be found from the early chapters in Z. Bahrani’s Art of Mesopotamia [Thames & Hudson; NYU N5370 .B16 2017]. But perhaps the best introduction at this point to the tablets themselves through the CDLI which places artifact images and their associated text together in an open-access platform. Lastly, it should be mentioned that the complete focus in learning cuneiform languages is on reading and not on writing texts. The language was of course inscribed into clay tablets using a reed stylus and, while working with clay has become a common enough activity in the Sumerian classroom, there is a certain artifice to reproducing signs with pen and paper. The site Cuneify Plus can help turn transliterated forms into cuneiform unicode. For example, by typing “lugal” into the interface, you can get back the sign 𒈗. But if you truly are committed to practice writing out signs, one book stands out as an attempt to overcome the artifice—D. Snell’s Workbook of Cuneiform Signs [Undena; Large PJ3193 .S64 1979]. 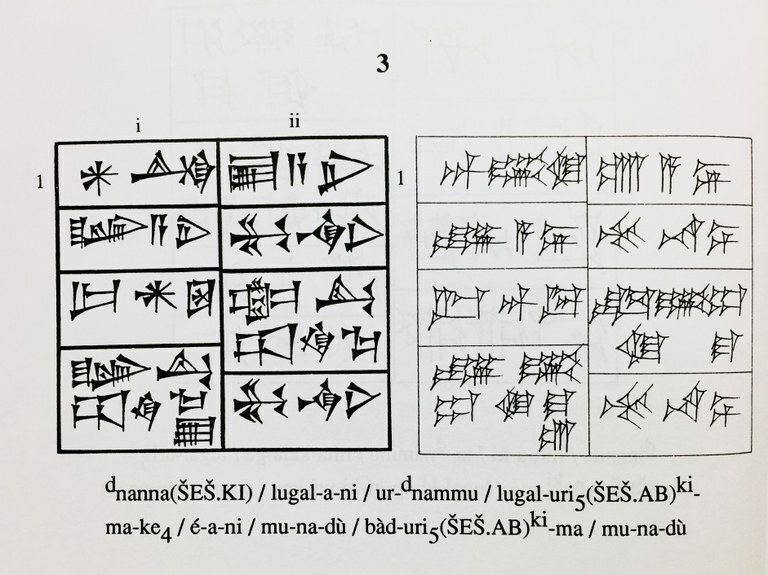 Based on Snell’s experience with learning the Japanese Kana, he encouraged “active use of the signs” (in learning Akkadian specifically) so that “knowledge of the signs will stay longer with the student.” The signs in this workbook are given in a Neo-Assyrian style and so would not match the forms seen in most Sumerian texts. Nevertheless, it stands as an entry point to applied cuneiform, and while the method does not appear to have seen general adoption, if there can be such a thing as a cult classic in the teaching of ancient languages, Snell’s idiosyncratic cuneiform workbook may be it. Thank you to Jonathan Valk and Martin Worthington for their suggestions on this post. Reading selection from K. Volk’s A Sumerian Reader, specifically an illustration of “’Urnammu 9” from the Cuneiform Texts from Babylonian Texts in the British Museum.